It was a black night. Nothing lit our Eastern sky, nothing. The tiny pinpricks of starry light were almost blotted out by the inky darkness. Nevertheless, our team was out there on the dunes, peering into our telescopes, occasionally lighting a small candle to jot notes and diagrams onto our parchments. It was a still night, which was a good thing. Sand grit can be a problem if it’s blown into our equipment and ink. Caspar was sitting in the middle of a huge groundsheet, gazing across to the horizon. It was so quiet that, even though I had my back to him, I heard it when he stopped breathing. He wasn’t dead, just dead surprised. I turned and said, “Cas?” and then looked where I thought he was looking. I set out over the dunes. With no illumination I stumbled along. Once I turned to look behind me and saw Caspar’s small candle. But behind him was a rising glow from near the horizon. I finally found Mel; actually I stumbled onto him. He cursed as I landed on him, causing his ‘scope to drop to the ground. “Look” I said, and standing close behind him with my arm alongside his head, I pointed to the west. He moved slightly to follow my direction. “Yes…” he murmured. “Are you thinking what I’m thinking” I asked. “I think I am, Balthazar!” he replied, and I heard the twinkle in his eyes. We ran then, back to Caspar, who had been consulting the charts. He was fairly jumping out of his skin! And that’s not bad for an eighty year old astronomer. This was the beginning of our journey westward. That little star, rising up into our world, had been predicted for centuries. But not as headline news in the Astronomers Of The East Gazette. No. It was hidden in the historical parchments of our discipline, to be discovered through intense cross referencing and study. A group of us were hoping and waiting for its appearance in our lifetime. And here it was! The following days were a buzz of preparations and talking. Our colleagues agreed that Mel, Caspar and I should be the ones to meet the promised King. The King born somewhere to the west of us. The King whose star we had seen rising in the darkness. And this King would be worshipped with gifts. So a committee was formed to find appropriate gifts. The gift registrars. They consulted the astronomical charts too, for clues. Each gift would be fraught with meaning. Finally they came on the night before we were to set out. Three packages were presented to us. “This one” another registrar said, holding up a small box, “was a tricky one. Something in our research suggested this new King is also Godly. So in this box is the very precious frankincense.” He handed it to Melchior. A third registrar stepped forward. “Finally, our last gift.” A few of the other members of the committee shuffled uneasily and looked down, as if they weren’t too sure about this choice of a gift. “Myrrh.” And it was offered to me. “this King is a God, so it should not be necessary. However, on the off chance…..” He was now clearly out of his depth so I stepped forward and took the package from him. He looked glad to be rid of it. The journey continued. The next morning we were assisted onto our camels and the whole assembly of astronomers were there to see us off. Our College president handed us the scrolls containing copies of the prophesies of the Hebrew Daniel, concerning the King we were seeking. And so we left our home in the East. It was together boring and exhilarating to be travelling. At night we pitched our tent, found our telescopes and studied the sky as we had always done. But we hardly needed the telescope to see that Star; it became larger and brighter every night. It was our signpost, our route map, our light for our path. During the days I reread Daniel’s prophesy. He was an alien in our country, captured over 500 years ago and brought to Babylon as booty. He wrote about his God and a plan to bring a saving Christ into the world. The ‘Son of Man coming from heaven’. When we reached the region of Palestine we made our way straight to the city of Jerusalem. I was glad to stop there. Beyond this country was the Mare Nostrum sea and I didn’t like sailing much. I preferred the ships of the desert – camels, and the waves of bare sand. At the palace the guards brought us before the ruler King Herod. He listened to the reason for our coming, and looked puzzled. “No new kings here!” he blustered. “A new born King, a baby perhaps?” I suggested. They came, and they confirmed what we had said. In the town of Bethlehem the Christ would be born. Now Herod ordered us out of the room while he conferred with his advisors. But then the door opened and we were called back in. We were to go to Bethlehem, find the baby King, and then return to Herod and give him the precise location. It was something about the way his moustache twitched when he spoke that made me wonder. His whole demeanour had changed since before, but that moustache was twitching! I didn’t trust him. Well, we found Bethlehem, and we found the King. Our star continued to lead us until it stopped over an ordinary-looking house in a plain old street. No palace, no royal crib, no red carpet. We felt a tiny bit overdressed for the occasion, and the gifts we brought seemed a tad too grand for such an ordinary child, but we knelt before him. His parents didn’t blink. It was as if they knew His importance, as if they understood Who he really was. I offered the jar of myrrh to the child’s mother. In my heart I felt some flutter of recognition as I gazed upon the small boy sitting on his mother’s knee. The star had brought me to Him. He was the end of my journey. He is in every room of our life. The following was written by my wife, a Christmas fanatic! “There’s a Nativity scene in every room of my home,” I tell people at this time of the year. I am a lover of Christmas. Unashamedly I celebrate the coming of Christ as a babe in Bethlehem. While others complain that putting decorations up in November is too early, I am thinking it’s not early enough. If eating mince pies is a reminder that Jesus came to redeem sinners, then what’s wrong with having them in the shops a week after Easter? And so I put a Nativity scene in every room. There are two, side by side, in the front window. They were fashioned in Peru; very simple creations that reflect the people of South America in their look and dress. One sits in a hand shape. On the stable roof of the other a little angel is curled up, asleep, while Mary watches her precious Baby and the wise men clutch their gifts. I stop to look while I’m rummaging in my bag for the front door key. Inside in the hallway there are three wise men standing to attention on the dresser. They are candle holders with small candles sticking up out of their crowns. Surely these visitors to Jesus were always destined to be bearers of the Light. They made their way to Jesus’ side by following a star. They found the Light, did a u-turn, and carried that Light back to the East from where they’d come. A few steps further, into the kitchen. Here is my best Nativity scene. It’s a beauty! A cross-stitched triptych depicting the shepherds, the Holy family, and the Magi, is the backdrop for the corresponding figurines in front. It’s a rich scene. The deep hues of the clothes worn by the characters, the ornate rugs carried by the camel, and the opulent gifts held out to the Newborn are contrasted with the straw I’ve strewn around their legs. I have collected extras for this scene – several animals, an odd assortment of angels – from around the world. The centre of their attention is Jesus. He lies in the lowly manger with arms outstretched. In our family room there is another Nativity on the piano. It’s carved from a piece of soapstone. It sits beneath another framed cross-stitch which says “Wonderful Counsellor, Almighty God, Everlasting Father, Prince of Peace”. The scene is simple. Three characters. One small, small Infant. Yet He is all that the quote from Isaiah declares. I go into our bedroom, and there on the mirror hangs another Nativity scene. It comes from Belgium. It is made of lace. In this scene it’s hard to see all the details unless you come close. Then you see the ox and the donkey, the shape of the manger and the tilt of Joseph’s head. Then you notice the haloes around the faces. Finally the bathroom and yes, there is a Nativity scene in here too. A plain wooden one; one piece. Joseph stands, Mary holds Jesus close to her breast. It’s on the bench above the washing machine. Today there is a pile of washing in front of it so it’s not easy to spot. A toothbrush, laundry powder and a bottle of moisturiser stand around it like bizarre wise men. The Holy family are witnesses to the business of a bathroom. It’s not pretty. It’s not clean. But it is the business of cleansing and beautifying. The Son is there in the midst of our muck. In January I will move through my home to collect my Nativity scenes. They’ll be carefully wrapped and stored away for the 9 months until early November. Jesus’ life will be compressed into our period of time between then and Easter. His birth, and then His death and Resurrection. Next December we will begin the Advent season again, waiting for Jesus. But in God’s reality of time, which is ‘time-less’, Jesus never leaves. He never arrives, because He always was. We don’t have to wait, because He is. And the dice rolled in my favour. When I get my day in the temple. We hadn’t seen one in hundreds of years. Nearly scared the life out of me! Easy for him to say! Beth, the old girl, will have a son. “Call him John,” he said. Not even a family name. And he will turn people back to God. How can this be? I said. And then I said no more. I couldn’t. I couldn’t talk. And I can praise God! Life and love became terminal. will rise and rule again. Has Jesus left the Church? I have deliberately made the title vague. It can be taken in a number of ways. I have just been observing the lead up to Christmas and Christmas itself in Europe. In some places like Seville there was a Christmas market which only sold items for nativity sets. In another few markets I could have bought gloves, scarves and solar panels to do me for a few lifetimes. There has been a mixture of the sacred and secular. All in all, the secular wins. But Christmas is only a microcosm of society’s attitude to faith and religion in general. So little of the Christ of Christmas remains but that is true of life in general. So has Christ left the church, in the sense that even the church has left the Christ of Christmas tucked away in some small corner? We sing the carols, attend church for the one time in the year but they are empty tokens. How many sermons were preached this Christmas that declared a radical Christ who introduced a new kingdom through his own death and resurrection? How many sermons declared Christ’s own words, “I am the way the truth and the life. No one comes to the father except through me.” That politically incorrect statement comes from the Messiah and is unpopular in many churches today. The cute baby in in a feed trough is easier to speak about and certainly less confronting. But there is an even scarier perspective. Christ withdrawing himself, not unlike the Shekinah leaving the temple in Ezekiel. Christ leaving because the people who bear his name do do so thoughtlessly. I know he says in Matt 28 that he will be with his disciples to the end of the age but that was on the basis of their continued faith (not perfection). The radical Christ, the counter cultural Christ, the Christ of a new and everlasting kingdom, the Christ who purchased the lives of his people on the cross and is now preparing a place in eternity for them, the Christ who dwells in his people through the Holy Spirit, the Christ who fought injustice and prejudice, the Christ who tells us that this life is only a brief pilgrimage … He is so hard to find in many churches and many western lives. Alas in my own life. Has Jesus left the church? Only if we, his representatives on earth, have left him. In our syncretititic and politically correct age we need need to have the courage of the one who gave us his name to stand up to the culture and attitudes of our age and reveal how amazing his message really is. This Christmas have we been overawed and amazed that God became one of us because He loved us so much? Have we been humbled by his claim on our lives? Are we rejoicing in the revelation of His kingdom? We have been watching the build up to Christmas in Europe. Our first sighting, apart from the supermarkets, came in Seville in Spain where there were stalls selling items for your own individual nativity scene, not just with the usual characters but a whole host of buildings, bridges, windmills, wells and etc. The Christmas markets in Northern Europe have been more intent on selling stuff – socks to solar panels. The same sound track seems to play in all the malls. Riding together in with sleigh bells and ” Santa Baby”. The U.K. has an added history of awful Christmas hits that must played. Christmas cards and tree ornaments have appeared, then the trees arrived and now the prices are being reduced as we get closer to the day. In Holland the Oliebollen kraams appear and my heart flutters. Even the boats in Harlingen are festooned with lights. 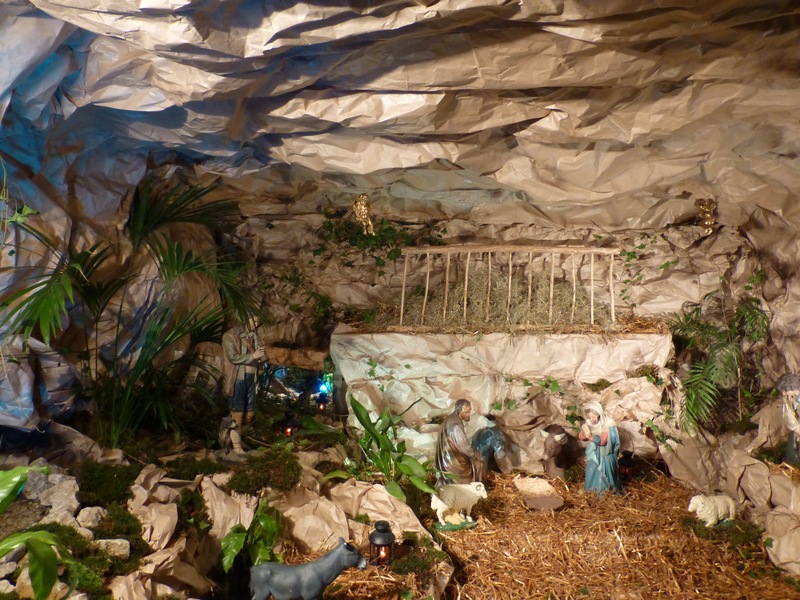 In the midst of the Santas, reindeers and fake snow we have observed some beautiful nativity scenes. 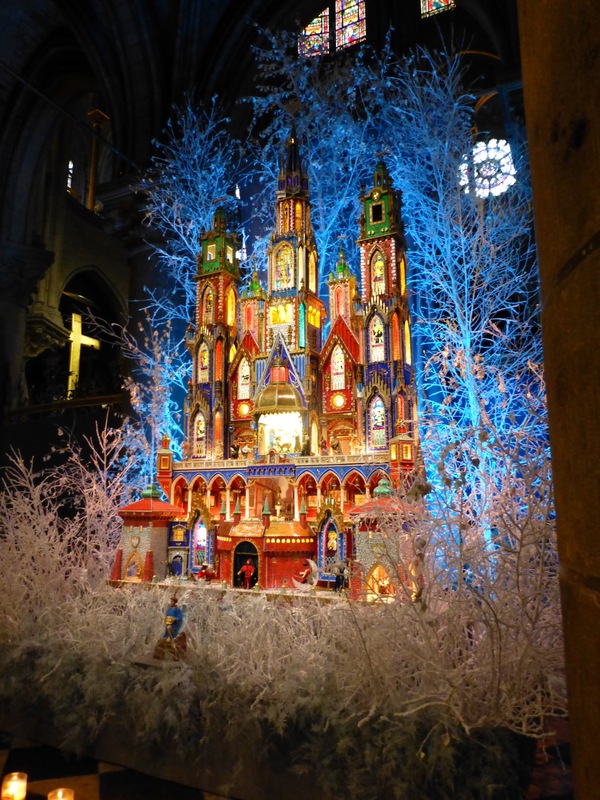 One cathedral had set aside a side chapel and created a beautiful life sized nativity. The Notre Dame in Paris has a strange tall well lit model building with the Holy family in the middle. What it signified remains a total mystery to me. In Dordrecht there was a confused looking “Mary” wandering about a pen of animals holding a baby in a “this Christmas market is taking far too long” manner. If I arrived from outer space knowing little about planet earth what impression would I get? I would be in no doubt about it being holiday, food and family time. However, the idea that Christians were celebrating the incarnation of their God who would die on the cross to restore His people with their eternal father is lost in the dross. I like food and holidays and even family, but the tragedy is that the heart of the season is missing. I may be mistaken but it seems that every year a bit more of the heart goes missing. The following is a guest blog from my wife, who like usual, doesn’t beat around the bush. She explores some of her feelings about how we as a society celebrate Christmas. This Christmas time I have a profound sense of gloom regarding the Message of Christmas. Particularly, the proclamation of it. Perhaps it is because, for the first time in many years, I haven’t told a child (or several hundred children) the story of Jesus’ birth. Or it could be because I tried, unsuccessfully, to find a new home for my huge stash of nativity costumes and props. Nobody does Nativity plays with the Sunday school kids anymore. Or maybe it was friends telling me about their church’s children’s service, or the friends and neighbours’ Christmas service- all taking place weeks, if not more than a month before the 25th of December. Or the depressing trips to the shopping malls, where I hear lots of Carols proclaiming the Good News, but nobody’s listening. It has just become seasonal background noise. 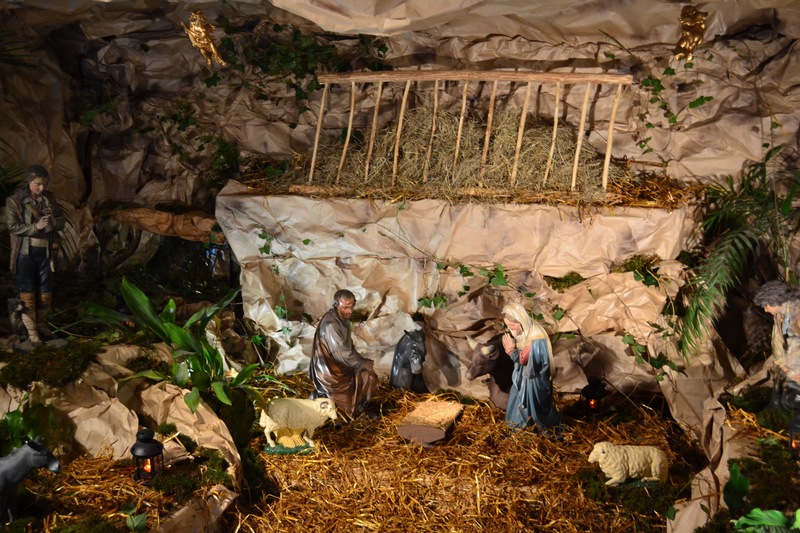 So what will the Church of our Messiah, who was born at Christmas, be doing on Christmas morning? Celebrating? Families will unwrapping presents, stressing about food preparation, and steeling themselves for that afternoon they must spend with relatives they don’t like. Children will be overwhelmed by gifts that will be broken or discarded by the end of the year. Worshipping? Most churches have a service. It’s earlier, shorter, and attended by the few poor souls who don’t have pressing family commitments. Where possible, the senior pastor has given the job of delivering the message to the idiot who first asked “Are we having a service on Christmas Day?” Nobody stays for coffee afterwards, because everyone needs to be somewhere else. Ignoring the whole thing? Yep, there are plenty of Christians who shun Christmas altogether. The anti-Christmas brigade, I call them. In my ideal world I would have Jesus’ Church celebrate His birth on the day that history has recognised for centuries. Whether it is the exact day or not is irrelevant. Children, in full costume, would tell the story before a packed house; choirs would sing carols; pastors preach their best sermon; the choicest and sweetest treats shared for morning tea, over which people would linger until it became lunch. This day would be eagerly anticipated and planned for months. And the world would know what is most special for Christians at Christmas.